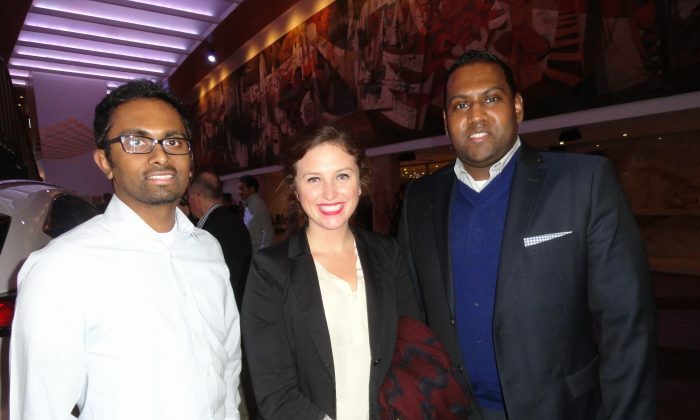 TORONTO—On Thursday night Dilhan Kamalendaran and his team members Kayleigh Hennessey and Tony Phillip were in for a treat as they took in Shen Yun Performing Arts at the Sony Centre. The world’s premier classical Chinese dance and music company is in town for six performances until Sunday, and the colleagues were in for a learning experience. Ms. Hennessey and Mr. Phillip both work as product coordinators under the leadership of Mr. Kamalendaran, a video product manager at Rogers Communications. “I think it’s wonderful, I think it’s really colourful, and I was really surprised with the background and the graphics,” said Ms. Hennessey, who was particularly enthused by the digital effects used in Shen Yun. “Just how they interacted and how they jumped off the ledge and then all of a sudden they were right back in the dance again,” she added. It was the first time she had seen this type of interaction between performers and the backdrop. “This is something brand new for me. I used to dance so I have an interest in theatrical productions, but this is very new to me. “This is kind of bringing me back to my childhood,” she said. Ms. Hennessey was also surprised to learn that acrobatics came from classical Chinese dance, a comprehensive dance system dating back thousands of years, featuring combinations of leaps, turns, flips, spins, and other aerial and tumbling techniques. “I thought it came from gymnastics so that was new to me. It’s informational,” she said. “I think the show did a really great job of telling the history and the culture of the Chinese people, so for someone who is obviously not Chinese it’s a good way to get exposed to the culture,” added Mr. Kamalendaran. He enjoyed seeing the different classical Chinese dance pieces as well as the folk and ethnic dances, and was also interested to learn about the beliefs found in traditional Chinese culture. Established in 2006 by a group of overseas Chinese artists, Shen Yun has set out to revive 5,000 years of divinely inspired culture, which has been nearly all but lost under the current atheist communist regime in China. “Just the whole concept of tolerance and helping others I found was inspiring,” he said. “In certain ways society should actually follow that wisdom. You should be tolerant and look upon your neighbour as if they were your family, and don’t look at them like they were strangers and look at them with open and welcoming arms,” he said. His colleague Mr. Phillip was also fascinated by the Chinese culture. “The Chinese culture is very broad and interesting—that is what I take with me,” he said. New York-based Shen Yun Performing Arts has four touring companies that perform around the world. Shen Yun’s International Company will perform in Toronto until Jan. 25. For more information, visit ShenYunPerformingArts.org.